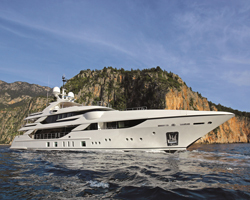 Expanded space, particularly in the living quarters and on the sun deck, is one of the key features of the forthcoming third build in Benetti’s FB800 Custom luxury yacht series (the FB801 model, M/Y Vica, is pictured). The Benetti FB803, M/Y Blake - currently under build at Italy’s Viareggio yard, with delivery scheduled for early 2018 – will incorporate a 60m² owner’s apartment, complete with a 6m² private balcony, as well as a 23m-long, 135m² sun deck. However, despite the increased space in onboard areas, the designer adds that it has managed to restrict FB803’s gross tonnage to 498gt. Special attention has also been paid to minimising onboard noise and vibrations. The newbuild will feature a length of 49.9m, a beam of 9.3m and a maximum draught of 2.7m, as well as a fuel capacity of 55,000litres and a fresh water capacity of 11,000litres. Classification of M/Y Blake is being overseen by ABS, although the vessel can also be registered with the UK Maritime & Coastguard Agency’s MCA LY3 certification, Benetti says.